It’s a long journey for many visitors to Edinburgh this time of the year but this is not new. Edinburgh has always been an international city with connections along old drovers’ roads, and one in particular reaches Italy named by renowned artist Richard Demarco as ‘The Road to Meikle Seggie’: a journey across land and time arriving at a community and hamlet in Kinross-shire. Demarco is the veteran of Edinburgh Festivals, having attended every single one. This year he has an public exhibition on sale at The Scotsman Hotel from the 2 August – 27 September, and includes intimate drawings of the hinterlands just off the Royal Mile and atmospheric landscapes from elsewhere . For visitors to Edinburgh at this time of year it is easy to see rich medieval history, the sophistication of the Enlightenment and the à la mode of the Festival. But recent history is equally fascinating, from the post-war invention of the Edinburgh Festival, the Traverse Theatre and the role culture played in bringing down the Iron Curtain. One man, Richard Demarco, has played a big part in these events with work that spans for more than sixty years and his archive boasts over 2,000 pieces. To keep the collection alive for the public this exhibition hopes to raise funds through limited edition prints. As an ideal introduction to Edinburgh there are drawings of the cobbled and character rich wynds and closes along the Royal Mile, but also key views from Craigmillar Castle and Carlton Hill. 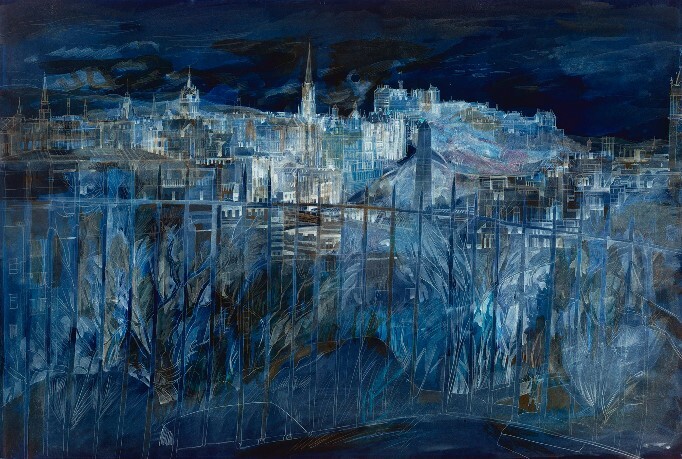 Light and colour play a key role with “Edinburgh at Night” lending a haunting and ethereal image of the city in dark and translucent colours, while the same view provides a second work with bright whites and creams familiar to a snowy day. This year is important for Richard as he celebrates the fifty year launch of the Traverse Theatre, as co-founder, but also his honour as first Briton to receive European Citizen of the Year. Europe is a subject close to Richard’s heart as he said:- “When I wake up I don’t say ‘Thank God I live in Scotland’ I say ‘Thank God I live in Europe.” This is not a surprise given his Italian roots and the part he played during the Cold War crossing the Iron Curtain ninety-seven times. But Richard Demarco’s reach goes further with an emphasis on the international language of culture harking back to the birth of the Edinburgh International Festival in 1947 as he said:- “Its reason for coming into existence was to use the language of art to heal the horrific wounds of a world war.” Demarco wants to keep this idea alive reflected in the international guests at the opening exhibition which includes artists and poets from China. “The Road to Meikle Seggie” would now reach a forgotten place, replaced by a farm and missing from modern maps, but Richard Demarco has captured Edinburgh’s spirit for future generations.